^^ scroll down to Carpenters!! But I tell you what I want: I want another one of those Passage mugs! A few years ago, someone posted a link here to, as I recall, a sale at eBay for them, and made a beeline to purchase a couple. They are sharp! I have one of those Passage mugs and I love it. Albeit, it is plastic, so I use it sparingly. But this ceramic YOM mug I want to use at work! One other thing about the Passage mug: I just display it with other commemorative glasses, shot glasses, etc. (I'm not a coffee drinker...). But those PBS mugs look incredible, too! I'm trying hard to talk myself into spending $60.00 for a mug. Maybe not today, but I think it will eventually happen! I don't remember the plastic Passage mugs being that expensive. They were a promotional item A&M sent out to radio music programmers along with the long sleeve t-shirts to promote the Passage album. I was fortunate to get both in 1977. They aren’t that rare, but now that 30 years have passed are indeed sought after collectors items for sure. I never used my mug either. Just displayed, and the shirt is way too small to wear now, size large. Still, they’re nice items to have in your collection. Geographer and GDB2LV like this. I saw the other day on eBay Karen Carpenter's 45 rpm Magic Lamp single "Looking for love" being sold for almost $1,900. 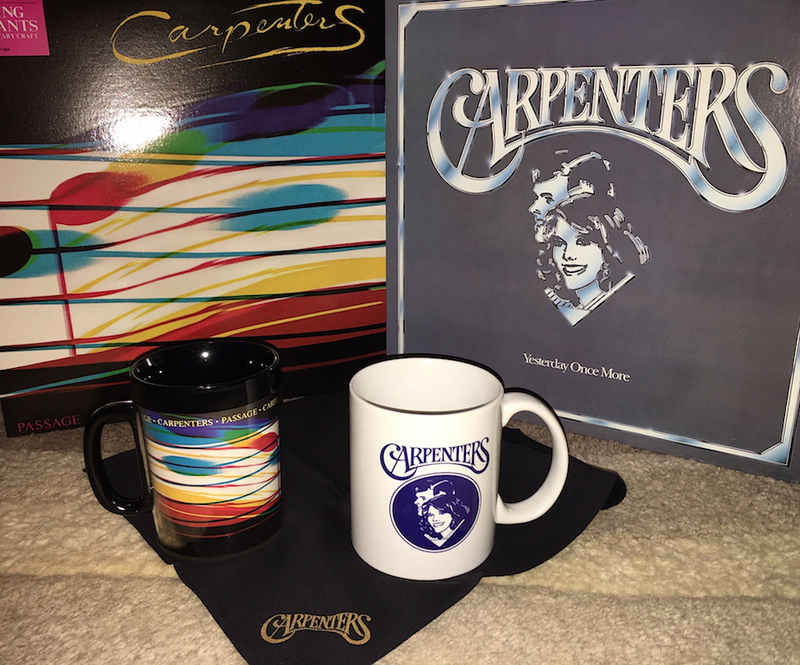 I guess that makes it probably the most expensive Carpenters record on the market, or do you you think there are any other items that can come close to that? It says vinyl, but looks like a cd to me. Confusing. I Saw that yesterday. The Magic Lamp single is one of the rarest records of all time. One copy sold for about $4,500 at auction in the late 80’s or early 90’s. eBay made it easier to obtain one and Richard putting it on the From The Top box set lessoned the value by over 50%. $1,900 is a decent price I think if you are a collector of all things Carpenters. Sad that the value went down. I think the record collectors book still gives a value of around $2,500 last time I checked. 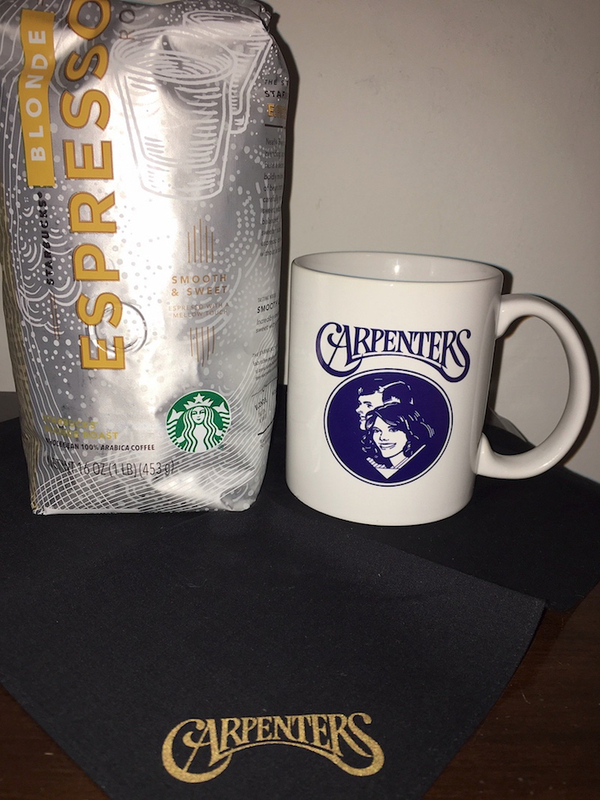 I'm terrible at picture taking but I got the Carpenters Yesterday Once More Mug in the mail today. It's hard to see from the pics but it's very white with a slight shiny glaze, the color is more of a navy blue. 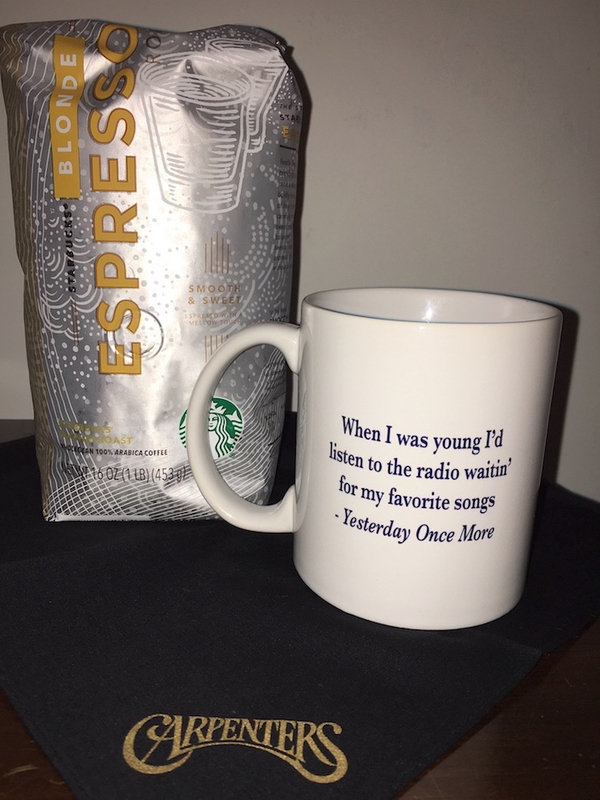 My Passage mug will no longer be lonely. Must Hear This Album, goodjeans, Jorge and 3 others like this. I don’t know where you are getting a CD from as it says “Side 1” & “Side 2” in the picture. Unless you’ve heard of a double-sided CD before (and I’m not referring to DualDisc, but an actual double-sided CD). But if you look at the track listing it is the unreleased tracks. The only mention that I can find for “CD” is that they listed it under the “Music-CD” category—-I’ve seen other records listed under that category before since some people don’t know how to check-off the Record catrgory. So this looks like a vinyl record that was made in Canada, not a CD. I got my mug yesterday too and early this morning, while it was still cool here in Florida, I made a cup of hot chocolate. Too bad it wasn't Morinaga High-Crown! Rick-An Ordinary Fool, CarpentersToYou and GDB2LV like this. Going through my vinyl today and I found a white label promo copy of Now & Then. The oldies medley actually has space grooves between each cut, though there’s no real delay between songs. I guess they did that so radio stations could play individual songs on air? Not sure, but novel as it’s different in that way from the commercial version. Also the quad lp mixes are fun and different too, even if you don’t have a quad turntable or system. I think any collectors would try to buy all three quad albums if they don’t already have them in their collection. You hear different background vocals etc. when listening to them. Rick-An Ordinary Fool and AnnaSock like this. How many here are being duped by this on eBay? CarpentersToYou, Joeyesterday, Rick-An Ordinary Fool and 1 other person like this. Ok. What is on the vinyl and what will eBay do when someone buys it and it’s not what they thought. And 11 people have placed bids?!?!? Hilarious! Sadly, I want one now. What’s on the B-side? Dancing In The Street? NO...it’s the Mono side of Jimmy Mack silly!!! Actually, I think the ad says "It's Really You". Is it wrong that I like the idea of that 7" and love the picture sleeve. Would have been a nice idea for the 50th anniversary for Record store day. I just saw the ad, mint 45 fan club? This sounds more like someone took the leaked tracks and paid some money to have a 45 rpm vinyl pressed. I wouldn’t be surprised if there isn’t some company out there that will press a vinyl of what ever you want on it for a price. The label itself is reason alone “something missing” Magic Lamp records.